How Open and Connected Is Government? According to Sukumar Ganapati and Christopher Reddick’s in a 2014 article titled “The Use of ICT for Open Government in U. S. Municipalities,” U.S. chief administrative officers (CAOs) were surveyed along the three dimensions of open government: transparency, participation and collaboration. The CAO’s reported satisfaction with implementing open government along with having a significantly positive view of collaboration. This could mean that open government is an idea whose time has come to stay for good. It also reinforces earlier efforts by other jurisdictions. 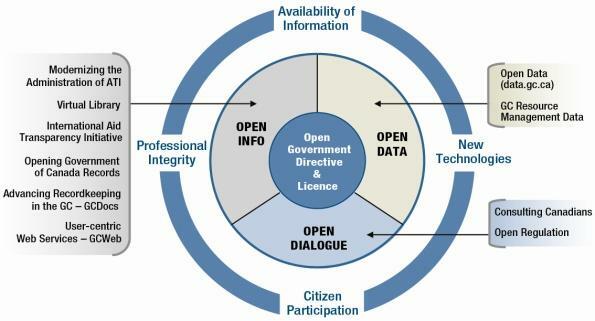 For example, the Honorable Tony Clement, president of the Treasury Board of Canada, said in 2011: “The Government of Canada remains committed to fostering the principles of open government,” and that it “offers Canadians greater opportunities to learn about and participate in government, in the economy and in our democratic process.” Through a diagram (below), the government synthesized 12 commitments. At the core are two commitments considered foundational to the success of Canada’s overall open government strategy: open government directive and open government license. Create real-time solutions to challenges in agriculture, health, transportation and more. Usher in a new era of policy- and decision-making. It is also in sync with the principles such as the right of the public to know or freedom of information. It also has economic, social, administrative and political benefits that will flow from the wide availability of such data. For example, top public managers in Ireland placed higher priority on the economic potential of open data to reduce costs and provide the private sector with a tool to enable it to generate employment and revenue, according to research from Emily Barry and Frank Bannister. Digital asset management, archiving and preservation. One’s personal experience as a citizen is revealing. The first challenge was getting a Queens Bench-issued guardianship order. The School Division, the school, lawyers, the Education Minister and the Court all appeared clueless regarding how to go about obtaining it. The Deputy Minister who received the brief from the Minister only managed to send a general email referring applicant back to the website that gives no direction. The second experience was a little bizarre. Attempts to know the outcome of my cousin’s application as a provincial nominee candidate, after I was interviewed several months earlier was rebuffed with a warning not to inquire about it until they get back to me. This does not appear to be an open government legacy. The third experience was a phone call to the Canada Revenue Agency office. After several attempts, I eventually got through. However, the auto response took me through many merry-go-rounds before announcing that I will not be able to talk to a representative due to high volume. Then the phone died automatically. So, how open, and how connected is our government to citizens?